A National Food Policy stemming from the development of a comprehensive roadmap toward a set of priorities for government action can benefit us all if we collectively leverage the abundant capabilities in the industry. •	the power of emerging science to transform the food system. There is growing recognition by disparate NFP advocates that there is benefit in working together to prioritize goals. So how would a National Food Policy affect grocery retailers? 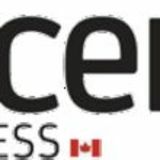 A walk through any of Canada’s better grocery retailers immediately signals they are immersed in the critical issues, including affordability, sustainability, health and, most of all, trust. However, there will be significant challenges to proactively manage an NFP; for instance: •	How to alleviate food insecurity without simply defaulting to cheap food. •	For our agri-food system to become the trusted global leader in safe, nutritious and sustainable food, there will have to be more Canadian agri-food on the shelf here at home. •	Most importantly, retailers must continue to set the gold standard in trust. The transparency bar will continue to rise on where food comes from, what is in it and how it is produced. 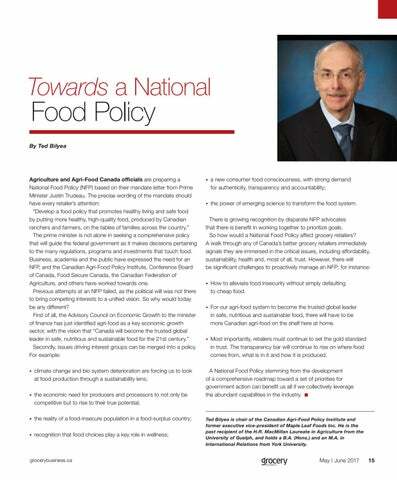 Ted Bilyea is chair of the Canadian Agri-Food Policy Institute and former executive vice-president of Maple Leaf Foods Inc. He is the past recipient of the H.R. MacMillan Laureate in Agriculture from the University of Guelph, and holds a B.A. (Hons.) and an M.A. in International Relations from York University.